The Blue Damsel Lodge is described by guests as a “Mansion in the Wilderness.” Built of massive Montana lodgepole pine over 3 years by a craftsman & his artist wife, the lodge contains many treasures in the form of craftsmanship & art work that have been hand painted & hand carved into the structure itself. Banisters, tile work, murals & fire places all reflect the magnificent work. 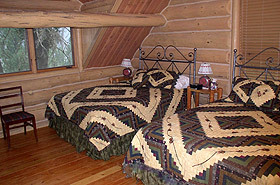 Your “mansion in the wilderness”, is a three story log lodge structure and one separate cabin, The Lewis & Clark cabin. The first & third levels of the lodge contain the 6 bedrooms, and sitting rooms. TV is available in the Pro Shop downstairs and wireless internet access is accessible from common areas of the lodge. The second (main) level of the lodge has the gourmet kitchen, bar, dining room & sitting area with wood burning fire place. Outside the lodge, guests enjoy the use of our decks, access to Rock Creek, horseshoe pit, fire pits, hiking trails and outdoor wood grill. You will enjoy sleeping to the peaceful sounds of Rock Creek flowing through the Welcome Creek Wilderness. The bedrooms are clean and comfortable & all uniquely set up to accommodate couples, singles, or double occupancy “fishing buddies”. With 7 bedrooms, we can physically accommodate 14 guests but we limit occupancy to 10 guests. In that configuration, we simply optimize space and privacy and you are assured of a private bathroom. With a small party, you are assured of this optimum occupancy. With a group size of 10 guests, you have the lodge exclusively. If your group is larger than 10, depending on the make up of that group, we can accommodate a total of either 12 or 14 and we will be happy to discuss the layout necessary to accommodate your larger group. Three bedrooms have fireplaces and 4 have Jacuzzi tubs. Our Managers will be glad to help you select the bedroom configurations that best suits your group.